Oct. 10: Is Romney Leading Right Now? Polling since the debate in Denver last week has generally been very strong for Mitt Romney. But there have also been a couple of rays of hope for Democrats and President Obama. One hypothesis is that Mr. Romney’s debate bounce was initially very strong, but has since faded some. There is a case to be made for this — but Wednesday’s polling made it weaker. Although Mr. Romney’s standing declined by two points in the Gallup national tracking poll, he improved slightly in four other tracking surveys, from Rasmussen Reports, Ipsos, Investors’ Business Daily and the RAND Corporation. And the state polling data that came in on Wednesday was generally consistent with about a three-and-a-half-point bounce for Mr. Romney, similar to previous days. There is some spotty evidence that Mr. Romney’s bounce may have been as large as five or six points in polls conducted in the 48 hours after the debate, so perhaps the most recent data does reflect something of a comedown for him. But if his bounce started out at five or six points and has now settled in at three or four, that would still reflect an extremely profound swing in the race — consistent with the largest shifts produced by past presidential debates. We’ll see what happens once the news cycle turns over, such as after Thursday’s vice-presidential debate. 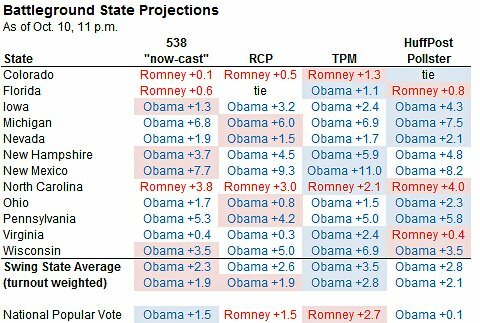 For the time being, however, Mr. Romney continues to rocket forward in our projections. The forecast model now gives him about a one-in-three chance of winning the Electoral College (more specifically, a 32.1 percent chance), his highest figure since Aug. 22 and more than double his chances from before the debate. Mr. Romney may have increased his chances of becoming president by 15 or 20 percent based on one night in Denver. The more troubling sign for Mr. Romney, however, is that although he’s made gains, he does not seem to have taken the lead in very many state polls. That trend, if anything, has become more entrenched. Of the half-dozen or so polls of battleground states published on Wednesday, none showed Mr. Romney ahead; the best result he managed was a 48-48 tie in a Rasmussen Reports poll of New Hampshire. How to reconcile this against the fact that Mr. Romney is about tied — or perhaps even has a small lead — in the average of national polls right now? From a forecasting standpoint, this is the question that the whole election may turn upon. There are basically four ways to explain the difference. 1) This is a statistical quirk that will work its way out of the system. 2) Mr. Obama has some pronounced advantage in the Electoral College relative to his position in the popular vote. 3) The state polls systematically overestimate Mr. Obama and underestimate Mr. Romney. 4) The national polls systematically overestimate Mr. Romney and underestimate Mr. Obama. Could State-National Differences Be a Statistical Fluke? The first proposal — that this simply reflects statistical noise — may be part of the answer, but I don’t know that it’s a sufficient explanation on its own. Since the Denver debate, there have been on the order of 12,000 people surveyed in national polls, and a similar number in the battleground states. The theoretical margin of error on a 12,000-person sample is about 1.8 percent in reflecting the difference between the two candidates. If it just so happens that the set of national polls have been a positive outlier for Mr. Romney and the state polls have been a negative outlier for him, then perhaps you can explain the whole of the discrepancy. But that explanation would be more compelling had these differences not also been apparent for most of the election cycle. An Electoral College-Popular Vote Split? The second answer is the most intuitively satisfying, and would make the boldest assertion: that in an election held today, Mr. Obama would be favored to win the Electoral College but would probably lose (or at best roughly tie) the popular vote. However, there are several powerful rebuttals to it. First, splits between the Electoral College and the popular vote are historically very uncommon. Second, the swing states are swing states for a reason: because they resemble (certainly collectively, if not also individually) the American electorate as a whole. There are a lot of voters in the nonbattleground states who are demographically similar to those in Ohio, Florida, Virginia or Colorado. (If Mr. Obama is performing well in Ohio, then it should figure that he’s also performing well with Ohio-like voters in noncompetitive neighboring states like Indiana or Kentucky, for example.) The set of swing states is also quite geographically diverse, covering almost literally the four corners of the country. Third, the campaigns have been roughly equal in their advertising spending this year. If one campaign had an especially heavy resource advantage in the swing states (as Mr. Obama may have had in 2008), then perhaps this explanation would make more sense. Fourth, this hypothesis depends implicitly on the idea that Mr. Obama, if he is overperforming in the swing states, must also be underperforming in the other states. Although there hasn’t been much polling outside the battleground states recently, the evidence from the polling before the debate was not very supportive of this idea. If anything, for example, Mr. Obama seemed to be performing comparatively well in deeply red states, seeing little drop-off from his 2008 results. Perhaps fresher evidence will lend more credibility to this hypothesis (one poll on Wednesday showed Mr. Obama’s margin falling substantially in California, for instance). But it hasn’t been that convincing up to this point in time. There are some reasons to prefer national polls to state polls. First, they probably come from slightly stronger polling firms on average and they often have larger sample sizes, although there are exceptions on either side. Second, they’re more straightforward to interpret — especially if you want to derive an estimate of how the national popular vote will break down. The alternative requires you to “add up” the polls from individual states, as well to estimate what share of the national turnout each state will represent. Our research suggests, however, that when the state polls and the national polls seem to tell a different story about the state of the campaign, the state polls sometimes (not always, by any means) get it right. One case in point: national polls on the eve of the 2000 election were consistent with about a three-point lead for George W. Bush. But the collective evidence from state polling was suggestive of a nearly tied race. In fact, the conventional wisdom at that time was that Mr. Bush might win the popular vote but lose the Electoral College — exactly the opposite of the outcome that occurred. The state polling generally told the more accurate story, however, describing a tossup race, rather than one favoring Mr. Bush. Similarly, in 1996, most national polls showed Bill Clinton winning by double-digits, while battleground state polls seemed to suggest that he would win by a smaller amount. Mr. Clinton’s actual margin of victory was eight and a half percentage points, more in line with the state polling. What advantages do state polls have? One is just that there are more of them. No, there aren’t more Virginia polls than there are national polls. But among Virginia and Ohio and Colorado and the other 47 states, there are quite a lot more. So even if the typical state poll is slightly less accurate the typical national poll, the collective sum of state polls may be more worthwhile than the collective sum of national polls. Also, the state polls come from a more diverse set of polling firms, and may provide for a greater degree of independence. What do I mean by “independence”? Here’s a dirty little secret: pollsters herd. Or to put it less politely: it’s probable that some polling firms, especially those that use less rigorous methodologies, cheat off the stronger ones — seeing what the consensus results are before weighing in on their own. One piece of evidence for this comes from a paper by the political scientists Joshua Clinton and Steve Rogers, who analyzed polling in the Republican primaries this year. They found that when a low-quality pollster was the first one to poll a state, their results were quite poor. But they did as well as any others once there were high-quality polls already released in the state — possibly implying that the low-quality pollsters were tweaking their assumptions to match the better ones. My own research is suggestive of a similar phenomenon. I’ve found that the more polls there are of a state, the narrower the spread between them — in a way that is inconsistent with normal statistical variance. Once there is a consensus established in a state, the pollsters may have an incentive to be in line with it. That may make the individual poll more accurate — but reduce the value of aggregating or averaging polls since the “wisdom of crowds” principle is strongest when individual members of the crowd are behaving independently. Otherwise, it becomes more likely that everyone will miss in the same direction. Even high-quality polling firms sometimes feel compelled to change their methods if they are out-of-step with the consensus. Gallup announced a set of changes to its methodology on Wednesday, for example. Although the changes are defensible on a theoretical basis (and although it’s much better to disclose the changes than not to do so), it’s awfully late in the game to be doing that, and makes it harder to compare recent Gallup results to past ones. The potential advantage of state polls is that, to the extent that the pollsters herd, they’re herding relative to 50 state-by-state averages rather than just one national average. So you aren’t putting quite so many eggs into one basket. Another advantage of relying more on state polls is that if you fail, you will tend to fail well. That is, if there really is a big difference between the Electoral College and the popular vote, the state polls will at least get the Electoral College winner right — and that’s what determines who occupies the White House. Still, the case is not a slam-dunk. So what the FiveThirtyEight forecasts do is to adjust the state polls in one direction, and the national polls in the opposite one, such that they match. So if you compare our forecasts to those of our competitors, what you’ll generally find is that we are higher than the other methods on our estimate of Mr. Obama’s standing in the national popular vote, but lower than the others in the individual states. In the chart below, I’ve compared the results from the FiveThirtyEight “now-cast” as of Wednesday night to those issued by three other polling sites: Real Clear Politics, HuffPost Pollster and Talking Points Memo’s PollTracker. The results cover the 11 battleground states that the campaigns have made a material amount of advertising expenditures in, along with each site’s estimate of the national popular vote. s turnout in 2008. Among the four methods, we have the worst figure for Mr. Obama in Iowa, New Hampshire, New Mexico and Wisconsin, and the highest in none. Our average result for Mr. Obama among the 11 states is also the lowest of the four systems, although tied with RealClearPolitics if weighted by turnout. The flip-side is that our estimate of Mr. Obama’s national popular vote is the highest of the four systems: the “now-cast” shows him one and a half percentage points ahead nationally, while HuffPost Pollster shows a tie, and the other two methods have Mr. Romney slightly ahead. Thus, we perceive only about a half-point difference between Mr. Obama’s performance in the battlegrounds and his national figures. This is similar to the actual results from 2008, when Mr. Obama won the 11 battleground states by an average of 7.7 percentage points (weighted by turnout) and the national popular vote by 7.3 points. By contrast, Talking Points Memo has Mr. Obama three points ahead on average in the battlegrounds, but three points behind in the national popular vote — a six-point spread. Real Clear Politics shows about a three -and-a-half-point gap, while HuffPost Pollster, whose methodology is the most similar to FiveThirtyEight, has a two-point difference. A two-point difference is within the realm of possibility, although our model would require a bit more evidence to support a difference that large (specifically, poor polling for Mr. Obama in non-battleground states relative to his polling in swing states). But there’s just no way that Mr. Obama would be even-money in the Electoral College if he were trailing in the national popular vote by four to six points. All of this is a very long-winded way of answering the question in the headline: is Mr. Romney ahead right now? None of the systems that rely on state-level polling say that he’s ahead in the Electoral College right now, although the FiveThirtyEight models perceive a slightly smaller Electoral College gap between Mr. Romney and Mr. Obama than some of the other systems. The difference is that we, and HuffPost Pollster, are looking at the Electoral College and the popular vote in a holistic way. The evidence is ambiguous enough that it’s hard to know for sure, but the fact that Mr. Obama appears to hold a lead in the Electoral College is reason to be suspicious that Mr. Romney leads in the popular vote. But here’s another way to think about the issue, returning to the competing hypothesis that we articulated earlier. If the national polls are right and the state polls are wrong, then Mr. Romney might be favored right now. If the state polls are right and the national polls are wrong, then Mr. Obama is ahead. And if you take them both very literally — meaning that Mr. Obama is ahead in the Electoral College but behind in the popular vote — then he’d win another term, after a very long election night. Two of the three hypothesis yield an Obama win. It’s something of a coincidence that our model now shows Mr. Obama with almost exactly a 2-in-3 chance of winning (as do Vegas betting lines), but it isn’t the worst way to think about the election. A version of this article appears in print on 10/12/2012, on page A11 of the NewYork edition with the headline: A Bounce for Romney, But Just How High?.